I love when an author can bring together science and magic and make it exceedingly fun. And, when that author can somehow fill the book with a political activism that hits home, well, then, it’s just an all-around good reading experience. Robert Weekes is the son of a county philosopher and war hero, but as a man, he stands well in the giant shadow his mother casts. Most men have no ability to practice philosophy --- a branch of science practiced by women that can call the power to heal and to fly --- but young Robert does possess a modicum of power. Enough to fly. It’s that ability his mother takes advantage of on a regular basis, pushing him into service with her to help with her duties as county philosopher. Robert, however, has bigger dreams than just being his mother’s sidekick. "THE PHILOSOPHER’S FLIGHT is a book you’ll race through, not only because you want to know who won the philosopher’s race, but also to see what happens to Robert." When Robert and his mother are called out on a mission, they encounter a nightmare. A murder of another local philosopher puts them in danger during the precarious rescue mission. It’s Robert’s actions that bring him the attention he needs and wants to finally make his dream of joining the rescue and evacuation corp a reality. When word of his heroics land him a scholarship to the all-women’s school of Radcliffe College, he jumps at the opportunity. If he thought it was hard to be a male philosopher in Montana, Robert vastly underestimates how difficult it will be to be a man at Radcliffe. His skills --- especially his flying skills --- earn him little admiration and his known desire to join the corp even less. Robert is derided by almost every woman he meets, with the exception of one who he manages to win over: a war hero, student and political activist named Danielle, who garners just slightly more public hatred than Robert. The country is at war overseas, but also at home. A radical group that believes women should be nothing more than fixtures at home to support their husbands has taken issue with the ideals that Robert and Danielle express and that their relationship exhibits. With the tension between the groups rising, everyone takes sides, even during a school-sanctioned race. 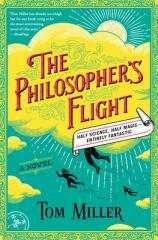 At its heart, THE PHILOSOPHER’S FLIGHT is a coming-of-age story. Robert is a mere 18 years old when he is thrust into the limelight and learns the hard way the consequences that his actions will have on his future. While the focus of the novel is a race of the philosophers to test their flying skills, and a chance for Robert to show just how valuable he would be as a corp member, it’s the politics that truly shine. Miller does a fine job not only of building a fantastic magical world, but of imbuing it with a highly relatable political ambiance. I love the tension he’s able to pull from Robert’s small world and how he pushes that same tension to its limit outside of Robert’s comfort zone. THE PHILOSOPHER’S FLIGHT is a book you’ll race through, not only because you want to know who won the philosopher’s race, but also to see what happens to Robert.